Figure A. Alexa Fluor 647conjugated mouse anti porcine CD45 (MCA1222A647) and FITC conjugated mouse IgG1 isotype control (MCA928F). Figure B. Alexa Fluor 647 conjugated mouse anti porcine CD45 (MCA1222A647) and FITC conjugated mouse anti porcine CD3 (MCA5951F). All experiments performed on red cell lysed porcine blood gated on lymphocytes. Data acquired on the ZE5™ Cell Analyzer. Figure A. APC conjugated mouse anti porcine CD27 (MCA5973APC) and RPE conjugated mouse IgG1 isotype control (MCA928PE). Figure B. APC conjugated mouse anti porcine CD27 (MCA5973APC) and RPE conjugated mouse anti porcine CD3 (MCA5951PE). All experiments performed on red cell lysed porcine blood gated on lymphocytes. Data acquired on the ZE5™ Cell Analyzer. 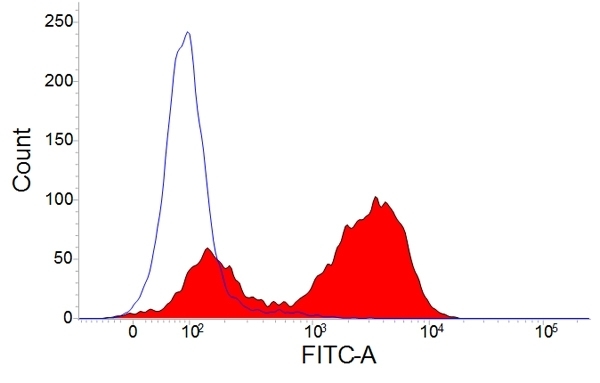 Figure A. FITC conjugated mouse anti porcine CD3 (MCA5951F) and purified mouse IgM isotype control (MCA692) detected with goat anti mouse IgM PE (STAR86PE). 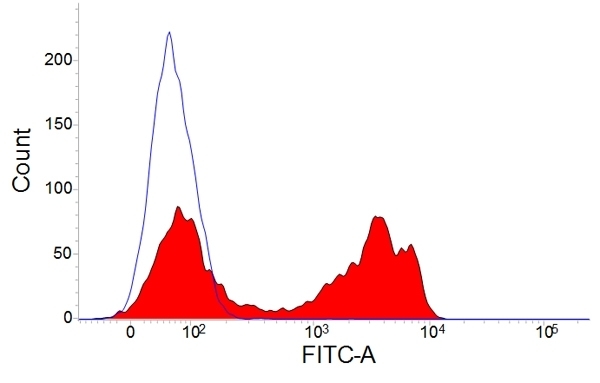 Figure B. FITC conjugated mouse anti porcine CD3 (MCA5951F) and purified mouse anti porcine CD45RC (MCA1750) detected with goat anti mouse IgM (STAR86PE). All experiments performed on red cell lysed porcine blood gated on mononuclear cells. 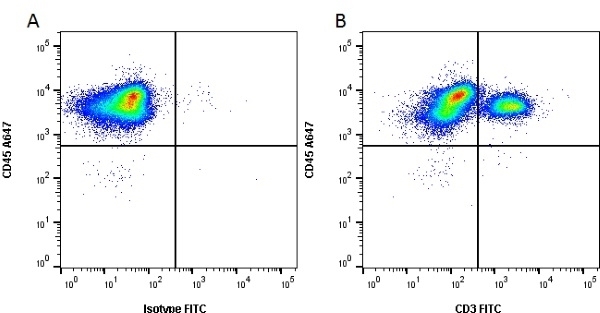 Figure A. Purified mouse anti porcine CD45RC (MCA1750) detected with goat anti mouse IgM PE (STAR86PE) and mouse IgG1 FITC isotype control (MCA928F). 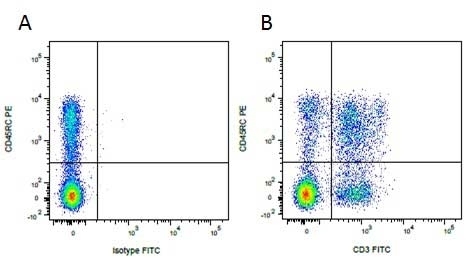 Figure B. Purified mouse anti porcine CD45RC (MCA1750) detected with goat anti mouse IgM PE (STAR86PE) and mouse anti porcine CD3 FITC (MCA5951F). All experiments performed on red cell lysed porcine blood gated on mononuclear cells. 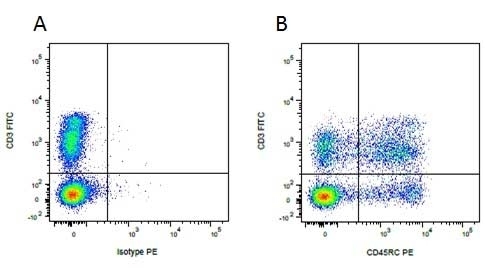 Mouse anti Pig CD3, clone PPT3 recognizes the porcine homologue of human CD3ε, a 24 kDa single pass type I membrane protein expressed by T-lymphocytes. Clone PPT3, also known under the clone designation FY1H2, was clustered at the second international swine CD workshop and found to specifically recognise an epitope on the porcine CD3ε designated as CD3c (Pescovitz, M.D., et al. 1998). CD3 is a multimeric protein complex composed of four distinct polypeptide chains (ε, γ, δ, ζ) that assemble and function as three pairs of dimers (εγ, εδ, ζζ). The CD3 complex serves as a T cell co-receptor that associates non-covalently with the T cell receptor (TCR) (Guy, C.S & Vignali, D.G. 2009). CD3 is a defining feature of cells belonging to the T cell lineage, antibodies recognising pig CD3 therefore provide useful markers of porcine T cells. Clone PPT3 has been demonstrated to recognise an epitope that is expressed both intracellularly and extracellularly, additionally clone PPT3 has been demonstrated to activate α/β T-cells (Kirkham P.A., et al. 1996). Clone PPT3 was tested on PBL from a range of other mammalian species and found to be negative suggesting that the epitope recognised by this clone is specific to porcine (Yang, H. et al. 1996). Yang, H. et al. (1996) Preparation of monoclonal anti-porcine CD3 antibodies and preliminary characterization of porcine T lymphocytes. Kirkham, P.A. et al. 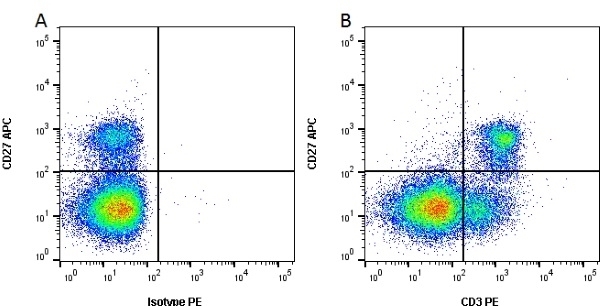 (1996) Porcine CD3 epsilon: its characterization, expression and involvement in activation of porcine T lymphocytes. Pescovitz, M.D. et al. (1998) Analyses of monoclonal antibodies reacting with porcine CD3: results from the Second International Swine CD Workshop. Vet Immunol Immunopathol. 60: 261-8. Forberg H et al. (2014) Early responses of natural killer cells in pigs experimentally infected with 2009 pandemic H1N1 influenza A virus. PLoS One. 9 (6): e100619. Guy, C.S. & Vignali, D.A. (2009) Organization of proximal signal initiation at the TCR:CD3 complex.